Easter is just around the corner! In so many ways it is the Super Bowl of Christianity, and it is going to be one incredible celebration at Good Shepherd! Take a look at our Holy Week schedule!! Palm Sunday 4/14 - Good Shepherd will host a Palm Sunday party after the 11am service! Free pizza for everyone & activities for the kiddos with an egg hunt! Holy Thursday 4/18 - The youth are in charge of this service at 7pm. Come & support them as they bring the meaning of service to you through their eyes. Good Friday 4/19 – The day of Jesus’ crucifixion is a turning point for history and for individuals. Out of this day comes one of the most important questions a person can ask: “Who is Jesus?” The choirs of Good Shepherd and Covenant UMCs join with professional instrumentalists to musically help consider an answer. Presentation times: Covenant UMC at 4pm, Good Shepherd UMC at 7pm. Easter 4/21 - Easter Sunday! Good Shepherd has two services to enjoy. The 9am service will have special choir performance with brass instrumentation. 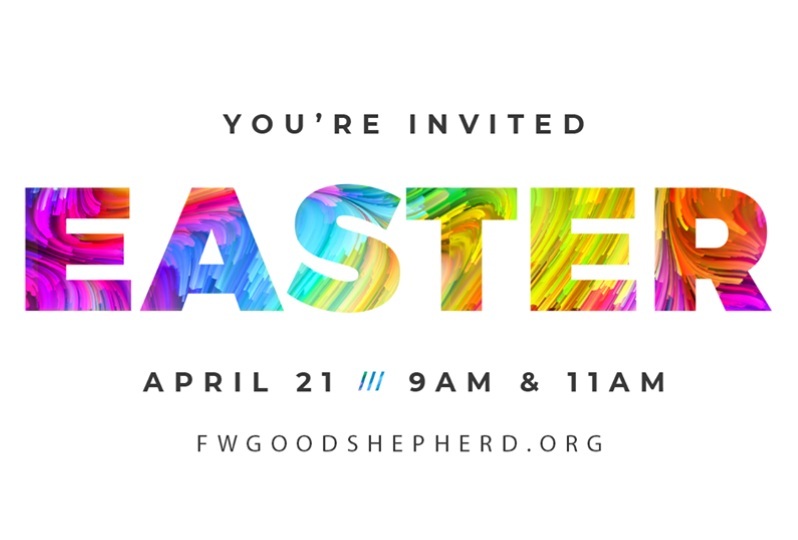 The modern worship band (11am) will take you on a musical journey of the Gospel as they explore Jesus’ death, resurrection, and how we still need His love today.